Advance planning make these a simple appetizer or side dish. Once every few months, I make a big batch of Bolognese sauce (modified from Simply Recipes). I make some lasagna that night, and then freeze the rest of it flat in zip-top bags. Flattening out the sauce in the bag makes it both easier to store and quicker to defrost (more surface area!). Meat sauces freeze really beautifully, and I can pull this bolognese sauce out for meals for months afterwards. 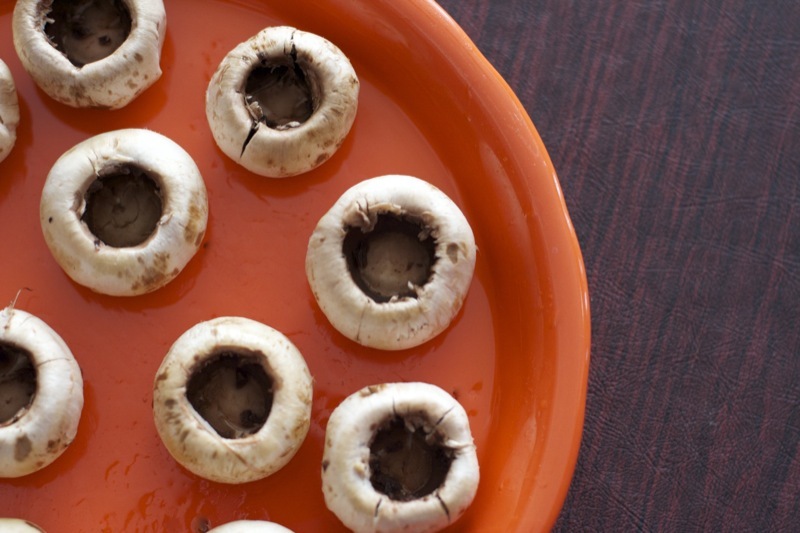 Prepare the mushrooms: You can use normal sized button mushrooms for this, you don’t have to get large stuffing mushrooms. Hold the mushroom upside down, and very gently pop out the stem. Just move it to one side with a little bit of pressure, and it’ll literally pop out. If there is a little bit of stem left, don’t worry, we’ll fix it. Do NOT throw away those stems. Freeze them for Odds-and-Ends Broth! Grab a tiny teaspoon (I used a 1/8 tsp – really, what else can you use these for?) Very gently scrape the gills and any leftover stem bits out from inside the mushroom. If the edges crack a little bit, it’s okay. 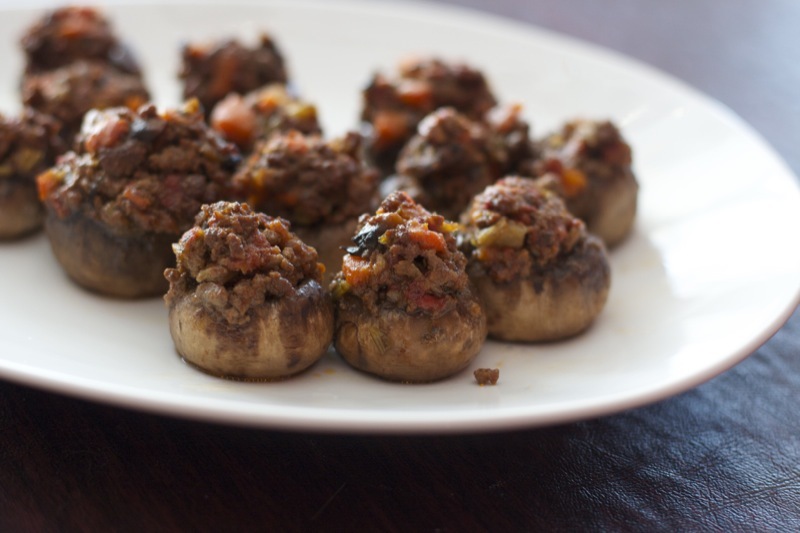 Stuff the mushrooms: Using a 1/4 or 1/2 tsp measure, put in one scoop of bolognese sauce into the empty mushroom cup. Use the tsp to push the meat down into the cup, where the gills used to be. Once it’s packed in, add another couple of scoops on top. Bake: Oil a pan with a bit of depth to it (because the mushrooms will release juices). Put the mushrooms in and bake at 350F for 15-20 min, or until the mushrooms have softened but can still hold their shape. Yum! 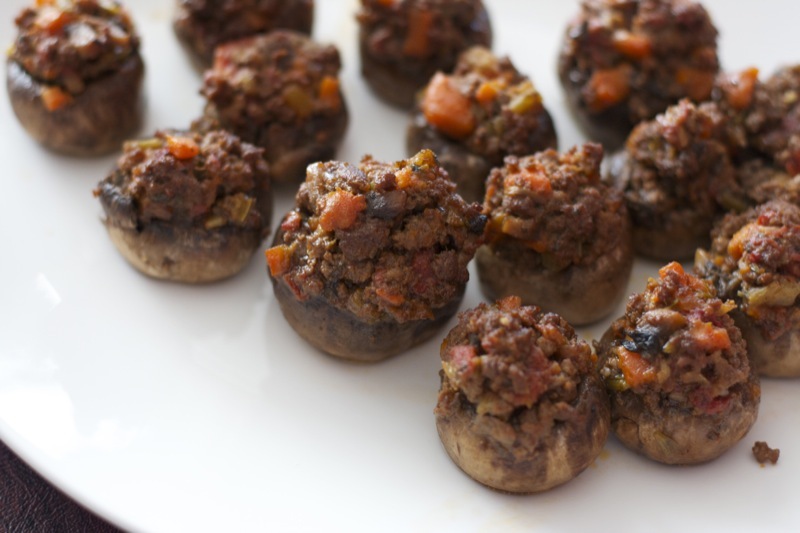 That version of stuffed mushrooms sounds quick, easy, and yet absolutely delicious! aoa Taiyyaba. i had stumbled upon ur blog while googloing for shahi tukray just few weeks before u went offline for ur Bar Preps. ur absence was really missed during those times as reading ur blog and getting to know some one like u was really a surprising change. i too got so bz with life in the mean while. and have come back again. so glad to know u passed the barexams. and yes the new layout of the blog is also very nice. it was another surprise!! havnt gone thru ur latest recipes thouhg . will do that now. but i cant c ur ealrier pics the ones during ur marriage or engagement i guess. even ur marriage ceremony stories r missing, or i cant locate them . plz let me know. good to know u really. plz remember me and my family in ur duas. Daniyal: Yes, I did take all these pictures myself. Do you like them?